1 "You're growing what?" Josh asked incredulously. 2 "Earthworms," said Carl. A smile crept onto his mouth. "You know, the little wrigglers you put on a hook to catch fish?" 3 "Yuck," said Josh, wrinkling his nose. "I don't know how you can stand to be around them, much less handle them. They're so slimy, and they're nasty looking, too." 4 "I'm not going to let a little bit of slime stop me," said Carl. "I think worms could be big business." 5 "Why would anyone care about worms?" asked Josh. 6 "Do you like to eat?" asked Carl. 7 "What kind of question is that?" Josh was perplexed. Was Carl trying to change the subject or just confuse him? He certainly wouldn't want to eat worms! 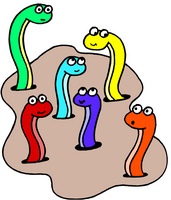 8 "Earthworms are great soil builders," said Carl. "You cannot grow food well if there aren't enough worms in the ground." 9 "How can worms affect plants?" said Josh.